Another translation is "The Woman Who Strayed"
Central Park, August 22, 2006 - Opera is boring. Which is why it's good to see it in Central Park. The Metropolitan Opera does a couple of free performances there every summer (as does the New York Philharmonic). The operas in the park are just concert performances. In other words, the shows are just sung, not acted out. Which is fine, because it's not easy to see the stage anyway. As you can see, the Great Lawn is packed with opera-lovers, and people who are too cheap to pay for tickets at the Met, and people such as me who find opera dull but enjoy chatting with friends, drinking a bottle of wine, and eating half one's weight in cheese. You have to bring your own wine and cheese; although the wine is technically illegal, Central Park being a public place, it was specifically encouraged by the pre-show announcer, who pointed out that, at the very least, one simply must drink during "Libiamo ne' lieti calici", which, as you no doubt know, is the famous drinking song from La Traviata. (Trust me, you've heard it before). The best thing about watching an opera in Central Park is that it's more comfortable to fall asleep there than in the Met. I 've seen two operas at the Met - Simon Boccanegra, and Carmen. Both times I could barely stay awake. Simon Boccanegra was particularly boring, and worse, I saw it before supertitles. So I had to remember the synopsis to figure out what was going on. The synopsis told me that in the last act, Simon "drinks poison, and he dies". Which isn't surprising, because the rule of opera is that the title character always dies. What I wasn't expecting was that the three words "and he dies" took forty-five minutes. Simon would die, a minor character would wander into the scene, and Simon would get up and sing a goodbye to him or her, then collapse again. Repeat for forty-five minutes. After half an hour, I was ready to drink poison myself. Carmen was better, especially since I knew some of the songs. (You should be singing the Toreador Song right now.) But it still went on way too long. Sometime in the eleventy-seventh hour of Act IV, I was done. Sadly, I can't fall asleep very well in theater seats. 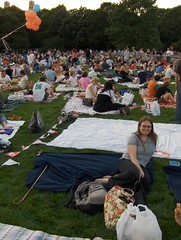 But I could stretch out and sleep on a blanket in Central Park, and that I gladly did during Act III of La Traviata. So if you're going to see an opera, see it in Central Park. It's free, you can bring food and drink, you can sleep, and it's way prettier than Lincoln Center. Plus nobody comes around selling glow sticks during a performance at Lincoln Center. Why should anyone have an opera without glow sticks? Like golf, I've always felt that opera would be much more interesting to watch if there was a defense on the field at the same time.